Did you know that as many as 1 in 80 adults are diagnosed as tall? Although there is no cure for tallness, the symptoms can be managed with appropriate treatment. Traditional tallness treatments include teaching patients to duck when walking through doorways, and how to stretch after getting out of a car. Pretty silly, right? But that’s how I felt reading an article in the latest issue of Massage Therapy Journal about working with clients with autism spectrum disorder. Read more over at Medium! By making pictures out of the names of the things depicted, Aaron aims to "heal the phonetic-ideographic language fracture which divides human cognition." These creative and memorable images can certainly help students of human anatomy keep track of the major bones and muscles, and I think they'll look nicer on my clinic room wall than the 1947 Peter Bachin chart which seems to be the industry standard. Back when I was in school for massage therapy, I applied for a scholarship for which I had to write an essay on why I chose massage as a career. Here is an excerpt from that essay. "Hi, uh, I took a massage workshop yesterday, and the instructor said I'm supposed to give a massage every day for the rest of the week. Would you like a massage?" In most parts of the world, this invitation might be met with healthy skepticism. But I'm at Burning Man, a week-long participatory arts festival deep in the Nevada desert, where fifty thousand people from all walks of life have gathered for an event unlike any other: all the music, art, bars, parties, and activities are built by the attendees, not the organizers, and all of them are free. It was here that I took the massage workshop, and was given this assignment. I'm shy, and not inclined to reach out to strangers, but I'm having such a great time here that I need some way to give back to this amazing community, and the workshop has given me an excuse. So when I see a stranger who has ducked into a large shelter to find respite from the dry heat and the unyielding dust of the Black Rock desert, I make my offer in an attempt to fulfill my obligation. The response is an immediate and enthusiastic yes," and in moments I'm giving my first massage. Over the next few days I repeat my offer, but I still feel shy. With each massage, my confidence builds - not because of how many people accept my offer, and not because each time, once the massage is over, the recipient's eyes light up as they tell me warmly and enthusiastically how wonderful it was. "That was amazing!" "Thank so you much!" And, more than once, "You should do this professionally!" What builds my confidence is this: during the massages, I can tell instantly when I'm doing something right. I notice the subtlest responses to my touch - tiny movements, changes in breathing and muscle tension that let me know exactly what my client is feeling. It's exhilarating, and when I'm done I feel as relaxed, and as healed, as they do. By the end of the week, just a few massages later, I'm starting to feel like a true healer. Too soon, I go back home to my job as a systems administrator. I had been finding the work stressful and unfulfilling, but after that week in the desert it feels easy and relaxing. Nothing can stress me out anymore - at least, not for a few weeks. Soon the tedium begins to grind on me again, and I get home every night feeling drained and empty, without the mental energy to socialize or even maintain a hobby. It took several more years before I realized I needed to make a more permanent change. 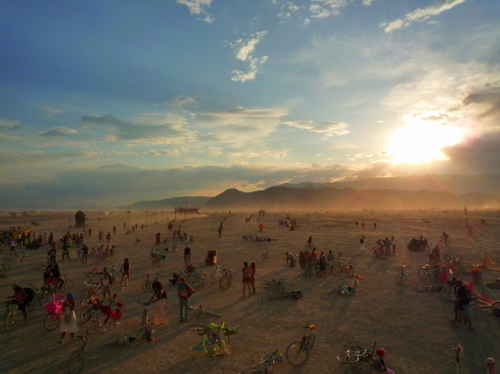 During my fourth visit to Burning Man, I gave more massages than ever. I could no longer ignore the fact that massage was fulfilling and meaningful to me in a way that fixing computers never would be. Now that my education is complete and I'm doing this professionally, I'm certain I've made the right choice. I still enjoy the intellectual challenges that computers provide, but only on the side. I've swapped my hobby with my career, and I'm much happier for it!